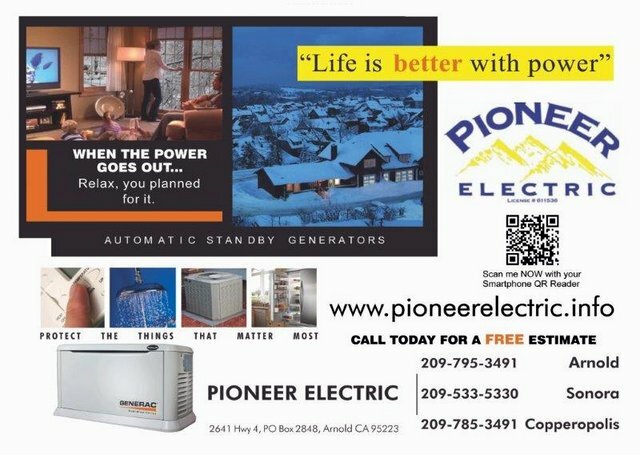 Arnold, CA...Pioneer Electric is a licensed and insured, full service electrical contracting business servicing: Calaveras, Tuolumne and beyond since 1984. Owner Tim Bennett and crew provides a full range of electrical and services for homes and businesses. Our service area includes: Arnold, Angels Camp, Sonora, Murphys, Copperopolis, Mountain Ranch and surrounding areas. We provide top-notch electrical services including general repair and trouble-shooting, light and fan installation, generator installation and service, service changes, and much more for new homes, businesses, remodels, as well as residential and commercial developments. Throughout the years Pioneer Electric has developed a reputation of trust and distinction, on which we pride ourselves every day. Because of this, repeat customers and their needs have become a substantial part of our day-to-day operations. Customer satisfaction is at the forefront of our overall mission because we know how important effective communication is in providing service quality. Our staff is prepared to see through any project, on time and budget.